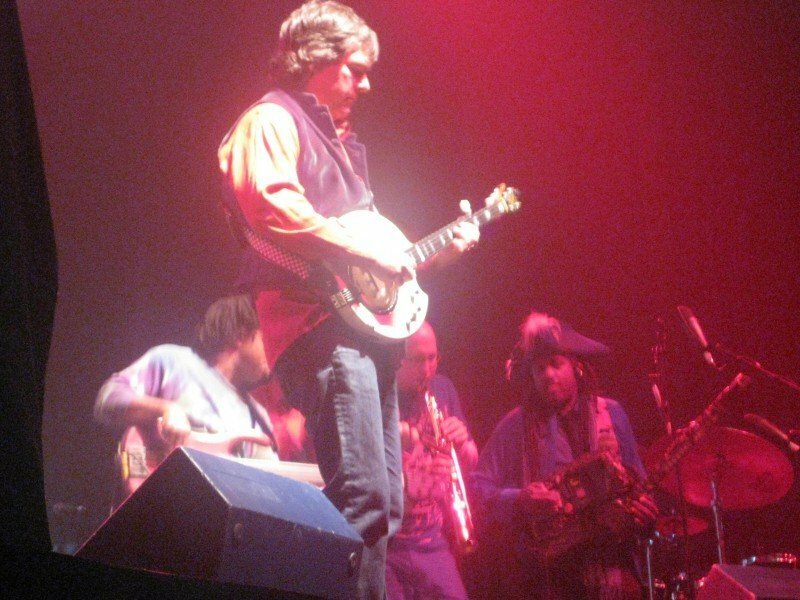 Bela Fleck and the Flecktones played the Orpheum Theater Sunday night in Madison. 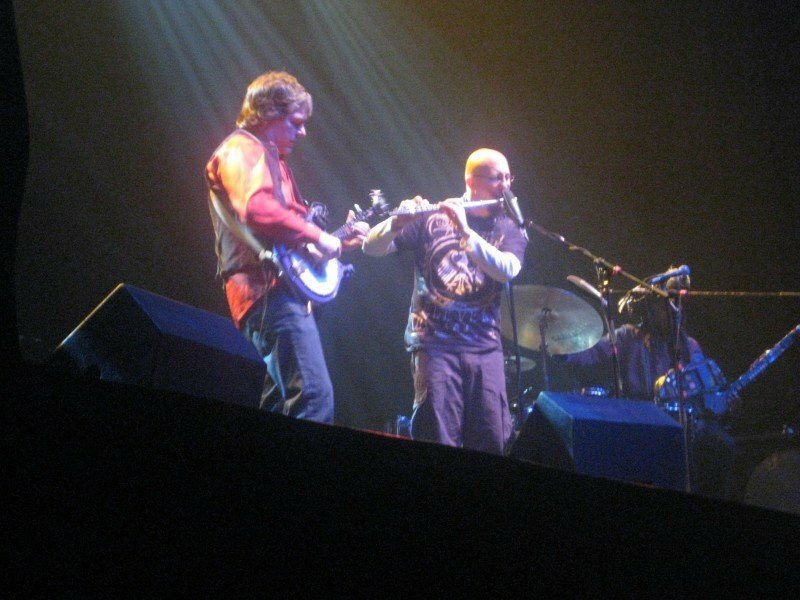 Bela Fleck and the Flecktones play Sunday night in Madison. Ever known a gift giver who liked to keep you guessing? They wrap up a pair of socks inside a milk carton, or put an iPod inside a jigsaw puzzle box (even going so far as to add in pieces so the box will rattle when shaken.) On Christmas morning, they don't just want you to like your gift, they want you to be totally surprised by it. Bela Fleck and the Flecktones approach Christmas songs with the same sneakiness. On the 2008 album "Jingle On the Way," which formed the backbone for most of the band's wonderful show at the Orpheum Theatre on Sunday night, the gonzo jazz-funk band completely re-invent familiar holiday tunes. So, early on in the show, the band delivered a rocket-powered "Sleigh Ride" that showcased the mind-boggling dexterity of Fleck on the banjo, the notes just cascading out as his fingers danced up and down his instrument. Each day of the "12 Days of Christmas" was played in a different key and a different time signature, leading to a wild ride by the time they got to "12 Drummers Drumming." Perhaps the nuttiest Christmas concoction came midway through the set, when four imposing-looking men in flowing long robes and braided hair sat at the rear of the stage. They were special guest artists The Alash Voice Ensemble, four Siberian men who are world-class Tuvan throat singers. Throat singing is an otherworldly sound in which the vocalist can seemingly hit several notes at once, the most prominent being a deep, hypnotic drone. As the men sang a slow, mesmerizing chant that reverberated throughout the theater, your ear could pick up a faint, high-pitched whistle emitted behind the drone that sounded strangely familiar. Wait . . . is that "Jingle Bells"? Moments like that were a breath of crisp fresh air blowing through the stale Christmas music genre, where everyone from the Jonas Brothers to Twisted Sister bangs out a quickie holiday album to make a few bucks. Case in point: early on in the first of the show's two sets, bassist Victor Wooten took center stage for an extended solo medley that toyed with "The Nutcracker Suite," "Rudolph the Red Nosed Reindeer" and "God Rest Ye Merry, Gentlemen," dancing around and in between the notes. At one point, he was playing the opening bars of both the verse and the chorus to "Gentlemen" at the same time, one over top of the other. It was absolutely jaw-dropping, and drew the first of several well-earned standing ovations from the large, enthusiastic crowd that night. "Somebody's been practicing," Fleck teased Wooten. "And as you know, practicing is like stabbing your colleagues in the back." Other holiday tunes were less radical but equally enjoyable, such as a gorgeous medley of Vince Guaraldi tunes from the "A Charlie Brown Christmas" soundtrack. And the full band, with special guest violinist Casey Dreissen, delivered some free-wheeling fusion jams that had a small band of college students crowded at the front of the stage dancing in full Bonnaroo mode. Fleck is no stranger to playing in Madison, but Sunday's show was truly special. The Flecktones' approach to Christmas music not only showcased the incredible creativity and ability of every member of the band, it let you appreciate songs you've heard a billion times as music again, instead of just big-box store background noise.